Not bad. I've got to get the drawing tablet out and use this for a ref. And for utter geekdom, see my Final Fantasy Play Arts Action Figures Guide, with links to Amazon and eBay listings. Any purchases made through these links, my webhost will donate $1 to Room for Read, a great charity! I especially like the first one. Nice use of shadows there, properly moody. Is your Auron's arm hard to remove and replace? Mine is permanently in the arm-out configuration because it was so stubborn. Having no respect for the sanctity of collectibles, I applied the teensiest, tinsiest bit of XactO knife trimming before I popped the arm in. I doubt anyone would see it without a magnifying glass, but I knew with my arthritic fingers that I would otherwise never, ever be able to change it... or even get the arm in... otherwise. Are models always this nice? The only ones I've ever had before were the original Star Wars, Trek:TMP and Buck Rogers action figures from the late 70s, and their likenesses were awful. 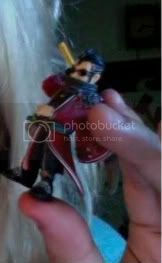 This is the only character model I have, other than the Final Fantasy gashapon blind box (miniature Japanese toys sold in tiny boxes that don't indicate which specific figurine is contained within) I picked up in Akihabara which, on a 12% chance, happened to be our favorite legendary swordsman. That one isn't quite as nice, but then it's essentially the Japanese version of a capsule toy and he's only about two inches tall, so I'm not going to be too picky. I'm really digging the first and fifth pics. Those flames right around his head and at the base of his sword are just snazzy as hell.